Non-motorized opportunities are available year-round. With more than 45 miles of trails, hikers of all abilities can enjoy incredible scenic views. Dogs on leash are welcome on all trails. Mobility issues? 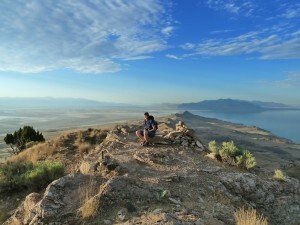 Check out our Possible Pathways Trail Chair sponsored by Friends of Antelope Island. The Trail Chair is available at the park Visitor Center. Most of the hiking trails are also open to biking, with the exception of Frary Peak and Dooley Knob. Bikers can find relatively flat, easy trails, or for those looking for more of a challenge, rides of up to 25 miles or more are available. Road biking is also permitted on the park. Caution should be taken while biking along the park roads, as there are no designated bike lanes. For those venturing on horseback, trail heads at Mountain View, White Rock Bay and Fielding Garr Ranch offer hitching rails. Horses must follow the route of the trail, up to 100 feet on either side, but should avoid walking directly on the trail whenever possible. No horses on Fray Peak or Dooley Knob trails. All access to the back country is restricted to trails. No cross-country travel is permitted. Only those trails listed on the park trail map are open to access. Please follow this rule to protect critical wildlife habitat. Dogs must be on a leash at all times. This not only protects the dog, but wildlife as well. The West Side/Buffalo Scaffold Trail from Split Rock Loop to Sentry Loop is closed from March 10 – May 20 to protect wildlife during critical lambing and calving season.